People with visible disabilities are all around us, some utilizing the amazing benefits of Service Dogs, we do not give these individuals a second look because their need for a service dog is apparent. Fortunately that service dog and handler team will never be questioned or looked at with suspicion. For those that use small service dogs their day is often spent being questioned by every business they walk into. We see this problem and feel we have a partial solution with regard to small dog credibility and visibility using our service dog cape vest for small dogs. Most typically small service dogs are used for those invisible disabilities which include Hearing Alert, Diabetic Alert, Seizure Alert and other Medical Alert disabilities. Because small service dogs do not look like a typical service dog and handler team, like ones for the blind, balance or mobility they are often questioned and scrutinized more often. We at workingservicedog.com have found that these small service dogs not only are questioned more often, there is also not a large variety of vests and supplies available to them. Over the years we have expanded our line of service dog cape vests for small dogs to include dogs from XXSmall weighing 4 pounds and up and we are proud that we can outfit any size and breed dog. The small service dog cape vest in the photo above is our most popular small service dog cape vest for both the trained service dog and the service dog in training. What handlers love about this vest is the soft flexible fabric, the omission of the leash attachment and front chest buckle. We purposely designed this small service dog cape vest with an elastic chest strap and an adjustable girth strap. There are no extra buckles to distract your service dog in training or for those dogs just getting used to wearing a vest. This cape vest also includes two patches (Choose from 36 ) so that your dog will be highly visible when out in public. Answering these questions are often handled by the patches you choose to display on your service dog vest. For example if you choose the “Diabetic Alert Dog” patch you have just answered two of the questions that are allowed to be asked. 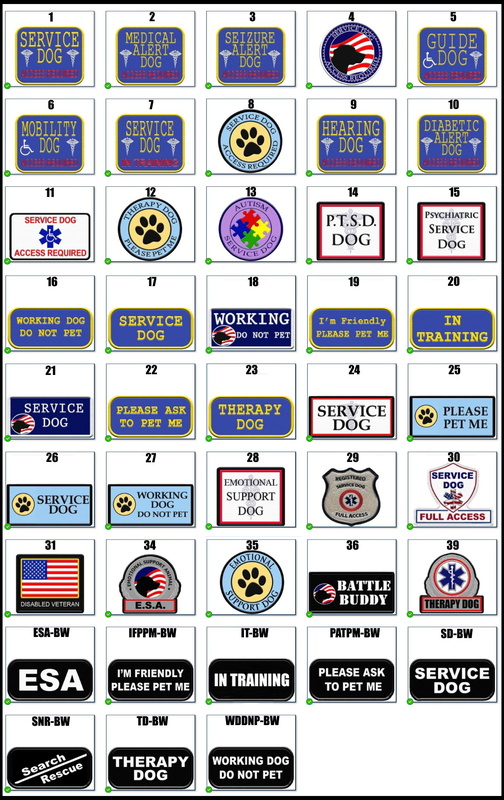 Below are the patches you can choose from when configuring your small service dog vest. 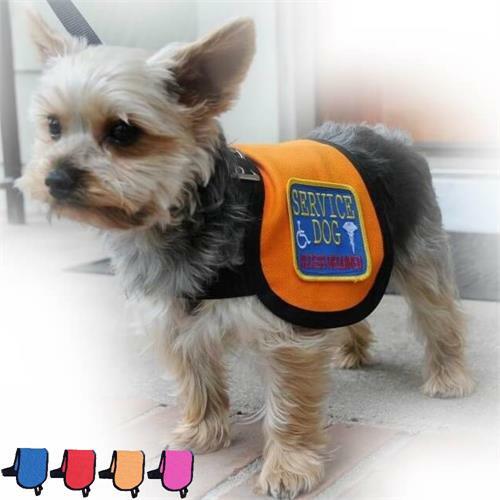 We hope that using our service dog cape vest for your small dog that your day will be just a little easier, and you can move around in public more freely. We are always available to help you, just give us a call.